MV. AMY GATTLE CHRISTENED IN LAKE PROVIDENCE, LA. AMY GATTLE CHRISTENED IN LAKE PROVIDENCE, LA. Terral RiverService recently christened the mv. Amy Gattle in an impromptu ceremony held at the company’s headquarters in Lake Providence, La. The 4,600 hp. Amy Gattle, formerly the mv. 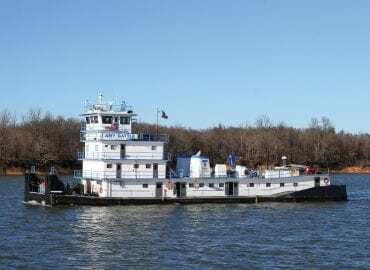 Mary Harter, was refurbished by First Marine repair yard in Paducah, Ky., earlier this year (WJ, March 24). Sporting a completely new interior, overhauled main engines, new generators, updated alarm system, pilothouse console and paint job, to cite just a few of the improvements, the rehabbed towboat emerged from the shipyard looking as new as its name. The namesake is the wife of the company’s vice president-transportation, Gabe Gattle, who was chosen to fill that position a short time ago. He is a 2006 graduate of Louisiana State University with a degree in chemical engineering and an MBA from Baylor University. He started with Terral RiverService in the marine division in June 2008.